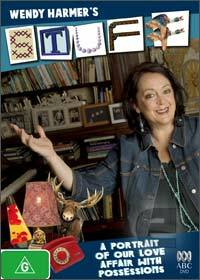 ABC comedian Wendy Harmer brings together a colourful and insightful documentary on why people collect "stuff". Bringing forth a variety of different occupations from prisoners, priests, sociologists and real Australians, she delves into this world wide phenomena of why people accumulate materialistic possessions with some going to extreme lengths such as hoarding. Through stories and interviews plus Harmer's own unique style of humour, this documentary is quite thoughtful and assists in explaining this phenomena to the viewer with most of us "humans" collecting something or another at one part of our lives. Revolving around the famous analogy of one's man junk is another man's treasure is quite true in this documentary and goes into the sociological and psychological understanding of this "problem" that some believe exists in this strange and wonderful world.